McKinney recorded 105 tackles (63 solo, 1.5 sacks) and seven passes defensed -- including an interception -- while playing in 16 games this season. Analysis: McKinney eclipsed the 100-tackle mark for the second time in his four-year career this season as he's continued to be a quality linebacker for Houston. He improved in pass coverage, with his seven passes defensed more than doubling the three he'd compiled in the three seasons prior. McKinney (foot) won't carry an injury designation into Sunday's game against the Jaguars. Analysis: McKinney was added to the injury report Wednesday with the foot issue, but he was able to practice fully Friday to avoid the questionable tag. The 26-year-old should serve in his usual starting role at inside linebacker in the regular-season finale. McKinney (foot) was a limited participant at Wednesday's practice. Analysis: McKinney picked up a foot injury during a Week 16 loss to the Eagles but played 71 percent of the defensive snaps, which is in line with his snap count over the past five games. Houston's defensive signal-caller has 100 combined tackles (60 solo) and a career-best six passes defensed through 15 games. McKinney recorded four tackles (two solo) and two passes defensed, including an interception, in Sunday's loss to the Eagles. Analysis: McKinney's interception was the first of his career. He's been a quality cover man this season, totaling six passes defensed to go along with his interception after recording just three passes defensed in his first three seasons. Through 15 games, he has 100 tackles (60 solo), including 1.5 sacks. McKinney and the Texans will face off against the Jaguars in Week 17. McKinney had nine tackles (three solo) in Saturday's 29-22 win over the Jets. Analysis: McKinney rebounded after combining for seven tackles over the previous two games, and leads the team with 96 combined tackles through 14 games. The 26-year-old added two passes defensed Saturday and continues to lead the team's linebackers in overall snap count. McKinney recorded 10 tackles (six solo) across 42 defensive snaps in Monday's win over the Titans. Analysis: McKinney was all over the field Monday night, including a critical fourth-and-short stop in the second quarter. He leads the team with 80 total tackles and is playing in more than 90 percent of the Texans' defensive snaps this season. McKinney recorded 11 tackles (six solo) and a sack across 62 defensive snaps in Sunday's win over the Bills. 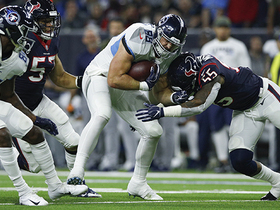 Analysis: McKinney has a sack in back-to-back games and he now has 44 tackles on the season -- as Sunday marked his first double-digit tackle count of the season. McKinney played 100 percent of the defensive snaps once again, as the 25-year-old continues to see a heavy workload alongside fellow linebacker Zach Cunningham. McKinney recorded eight tackles (six solo) and 0.5 sacks across 62 defensive snaps in Sunday's win over the Cowboys. Analysis: McKinney played in 100 percent of the defensive snaps in the Texans' overtime win over the Cowboys on Sunday night. The 25-year-old has taken on a heavy workload this season and now has 33 tackles on the year. McKinney signed a five-year, $50 million contract extension that includes $21 million guaranteed, Adam Schefter of ESPN reports. Analysis: Entering the final year of his rookie contract, McKinney is now under contract through the 2023 season. The age 25 linebacker has been a consistent player since entering the league, starting in all 32 games for the Texans over the past two seasons while totaling 224 tackles in the same span. He's a hallmark in the center of their defense and his contract indicates he'll continue to be for the next several years. 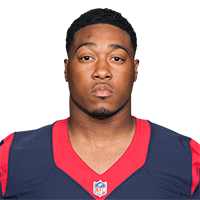 McKinney recorded 95 tackles (62 solo) and three sacks in 16 games for the Texans in 2017. Analysis: McKinney started the season strong with 17 tackles, two sacks and a forced fumble across Weeks 1 and 2, but didn't log any other true impact performances. All in all it was a decent season for the 25-year-old, but a definite step down from his 129 tackle and five sack output in 2016. The 2015-second round pick will aim to recreate that production next season as he enters the final year of his rookie contract. McKinney had seven tackles (five solo) and one sack against the Titans on Sunday. Analysis: The third-year pro hadn't posted a sack since Week 2, but his average of 6.2 tackles per game helps make up the difference. McKinney played all 54 defensive snaps Sunday, and since that is expected to keep up, he'll be due for more outings like Week 13. McKinney finished Sunday's victory over the Cardinals with nine tackles (seven solo). Analysis: McKinney's tackle total marks his second highest of the season, as he logged 11 (four solo) in the Texans' season opener. The 25-year-old was the only defender on the team to see all 58 snaps. 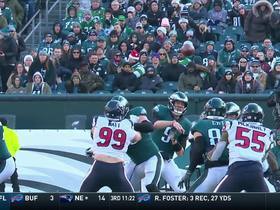 Houston Texans linebacker Benardrick McKinney tips Nick Foles pass to himself for an interception. New York Jets push the pile for go-ahead touchdown. 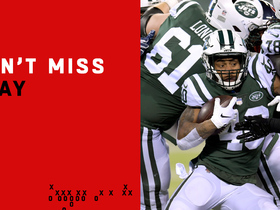 New York Jets push the pile for late touchdown against the Houston Texans. 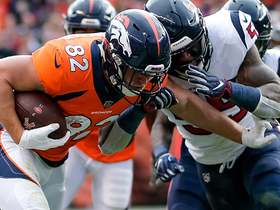 Denver Broncos tight end Jeff Heuerman unleashes an epic stiff arm on a pass from quarterback Case Keenum for 14 yards. 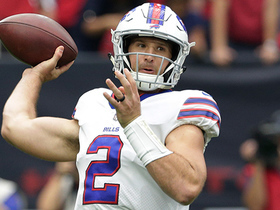 Buffalo Bills quarterback Nathan Peterman launches a dime to wide receiver Andre Holmes for a 20-yard gain. 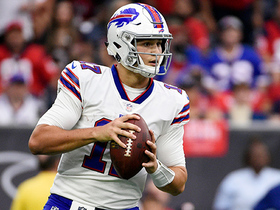 Buffalo Bills quarterback Josh Allen escapes Texans defense to throw a 22-yard pass to LeSean McCoy. 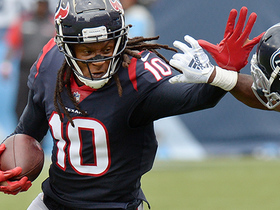 Houston Texans quarterback Deshaun Watson connects with wide receiver DeAndre Hopkins for a 25-yard gain. 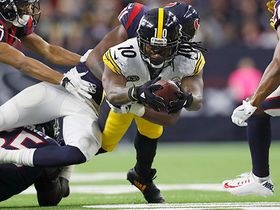 Pittsburgh Steelers quarterback Ben Roethlisberger connects with Martavis Bryant for a 12-yard gain and first down. 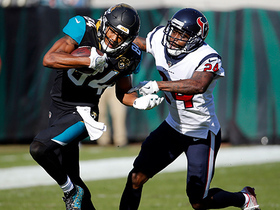 Jacksonville Jaguars wide receiver Keelan Cole speeds down sideline for 73-yard gain vs. the Houston Texans.